Special Containment Procedures: All non-inflated SCP-3551 instances are to be kept in Storage Locker-51 at Site-42. Inflated SCP-3551-1 instances are to be kept in standard humanoid containment chambers, and their SCP-3551-2 instances confiscated and stored in Anomalous Weapons Locker-52. Guards assigned to SCP-3551-1 instances are to carry standard Foundation combat knives to ensure continued cooperation. SCP-3551-1 instances are to remain under the impression that any sharp object will result in their immediate fatality, and all recovered instances are to be led to believe in the ruse as well. SCP-3551-3 instances are to be kept in a containment room with an airlock chamber which separate it from the rest of the facility. They are to be fitted with tracking devices. Due to the nature of SCP-3551-3 instances, sightings from civilian populations are to be viewed as a low priority. Mobile Task Force Alpha-23 ("Meddling Earthlings") are to track and intercept uncontained SCP-3551 instances. Had an inflatable encounter of the third kind? Well, now you can! You can take part in the conquest of Earth with Dr. Wondertainment's Inflatable Invasion pack! Wow! You can now build an army of invaders and conquer the Earth! See them fire their lasers and their UFOs soar across the sky! Hear the alien invaders speak and enjoy the light show from their cool blasters at night! Have fun that is out of this world! All it takes is some air or helium and the fun begins! Caution: Dr. Wondertainment and associates are not responsible for any loss of sight due to misuse of the lasers. SCP-3551 anomalous properties do not occur until it is inflated with air or helium. When fully inflated, the object will remain inflated. This is due to the plug containing the air within the item sealing on its own, and therefore can not easily be deflated. The material the instances are comprised of is resilient to piercing, but is vulnerable to intense heat. SCP-3551-1 instances have the appearance of a generic "grey alien" and come in a variety of colors (see file image). Instances have a tag that brand them as "Invaders" and with a name belonging to the instance that it will identify as. Instances of SCP-3551-1 are sapient and can vocalize fluent English speech via unknown means. They have a persistent desire to "conquer the Earth" and "enslave mankind" though they are harmless and somewhat incompetent. Though instances are highly intelligent in some respects (see Incident 3551-01) despite being generally foolish and inept towards achieving their goal. SCP-3551-2 are inflatable toy guns based on laser weapons from science-fiction media of the 1950s. On the packaging, they are referred to as "Laser Blasters." The items have external LED lights that light up when firing. Instances fire a weak red laser beam that is relatively harmless. Though shots fired repeatedly into the eyes, can cause temporary and long-term blindness. Wearing sun glasses can serve as adequate protection. SCP-3551-3 instances are small and designed to resemble a "flying saucer" that are often claimed to be sighted and referenced in media. They have no tags unlike previous instances and on the packaging they're referred to as "UFO Flyers." When inflated, subjects are capable of flight via unknown means around their vicinity, and light up with external LED lights at night. Instances have been shown to posses minor intelligence with a social capacity with one another, some forming groups with hierarchies. They would occasionally interact with SCP-3551-1 instances. Although, they prefer not to due to -1 specimens sometimes attempting to 'board' them. The Foundation became of aware of the existence of SCP-3551 items from an investigation performed by the Unusual Incidents Unit of the FBI. 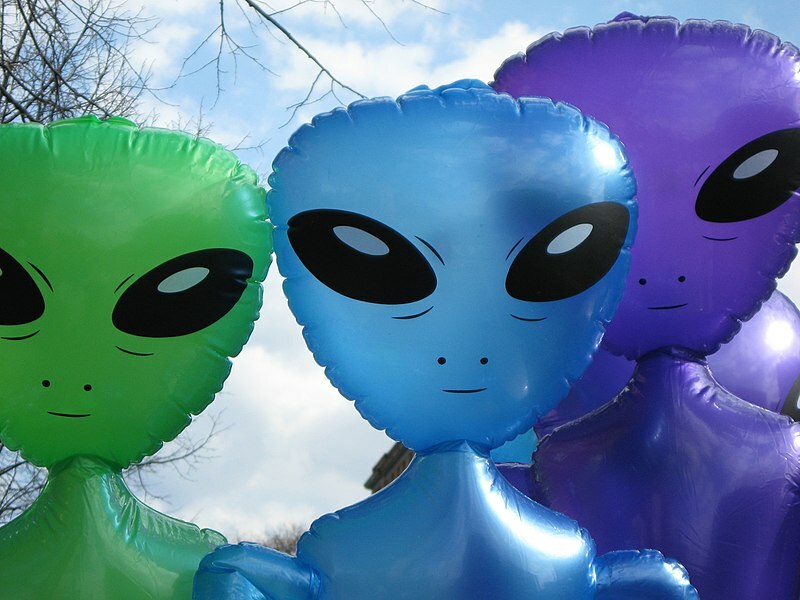 Agents from the unit were investigating standard alleged sightings of UFOs (later confirmed to be -3 instances), and stumbled upon a warehouse containing crates of non-inflated and inflated instances. The UIU agents immediately reported the discovery to the Foundation. Since then, the Foundation has captured ███ instances. Incident 3551-1: On 5/18/██, a local television broadcast hijacking occurred at the town of █████ in Canada by SCP-3551-1 instances in an abandoned building. Four instances were responsible and are designated as A through D for the following transcript of the broadcast. For their actual designations and further information, request them from Dr. Pattinson. A: Attention Earthlings! Take us to your feeders! B: What? Zam, you air-headed fool, it's "leader", not "feeder!" C: Told you he wasn't ready, Poxy. B: Silence! You didn't tell me nothing! D: [Instance speaks from behind the camera] Uh, guys, we are broadcasting live to the humans. C: It's mostly water than dirt really. B: [Brief silence and continues with a tone of agitation] Humans, we are coming and you will fall before the might of us. Resistance is futile! B: Shut up! Anyway, the invasion is here! For those who sympathize with our soon-to-be rule, you may aid us and in reward you may serve us for all eternity. So yeah, submit or perish! After all, we have LASERS! The best in the galaxy! B: Shush! They don't know that and neither do you! You are just a lousy shot, Krag. C: I would like to challenge that claim. Incident 3551-02: An SCP-3551-1 instance was lifted by a gust of wind and, panicking, landed in Site-██. Instance was interrogated and stated that it was "studying the enemy base" from a nearby hill. Instance was transferred to containment after it refused further communication. Incident 3551-03: A group of SCP-3551-1 instances accompanied by two -3 instances attempted to attack a pool party at ██████, California. Instances were apprehended by party-goers before being retrieved by Foundation agents. Incident 3551-04: During an unrelated investigation, Agent ██████ Pierce went to a scrap yard as a part of a lead and came across an SCP-3551-1 instance. The subject was found being used as a chew toy for the guard dog of the scrap yard, and it called for help while proclaiming surrender. Agent Pierce reported the discovery and recovery teams arrived. An interrogation with Mr. ███ ████, the owner of the property, revealed that he discovered the instance when it attempted to steal materials. Amnestics were given and the instance was transported to containment. During transport, it reluctantly thanked the recovery team and stated, "One day I will learn to defeat your dreaded war beasts, but today I accept my defeat." Document 3551: On 04/12/██, the following note was mailed to Site-██ along with addresses of storage warehouses containing untouched SCP-3551 instances. I wish to thank you for your efforts in collecting all my colorful little space invaders and associated products from the Inflatable Invasion pack. I see you have been having fun with them and I feel ashamed at discontinuing this line of product. I appreciate you giving them a nice home at your facilities and hope you manage to find them all, my dear collectors. I have plans for perhaps a bigger and better, possible revival though we will have to wait and see. Until then, continue having interstellar fun.